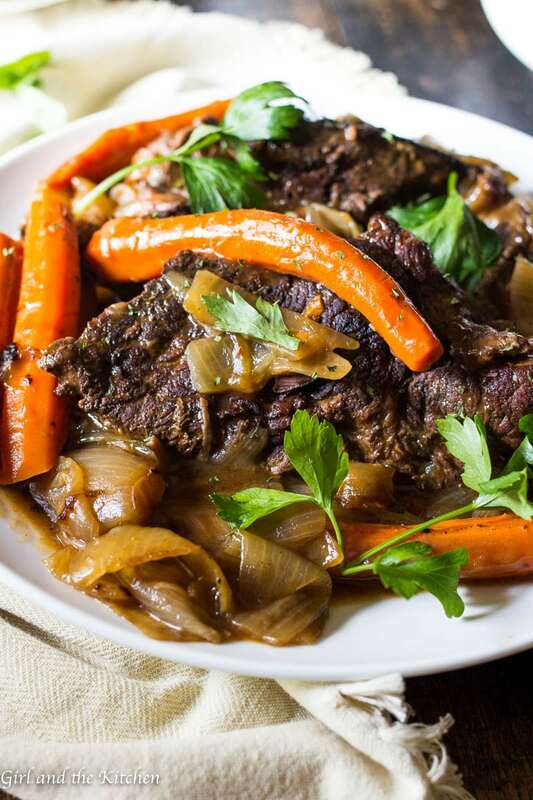 The most succulent and flavorful one-pot pot roast is just a few steps away. 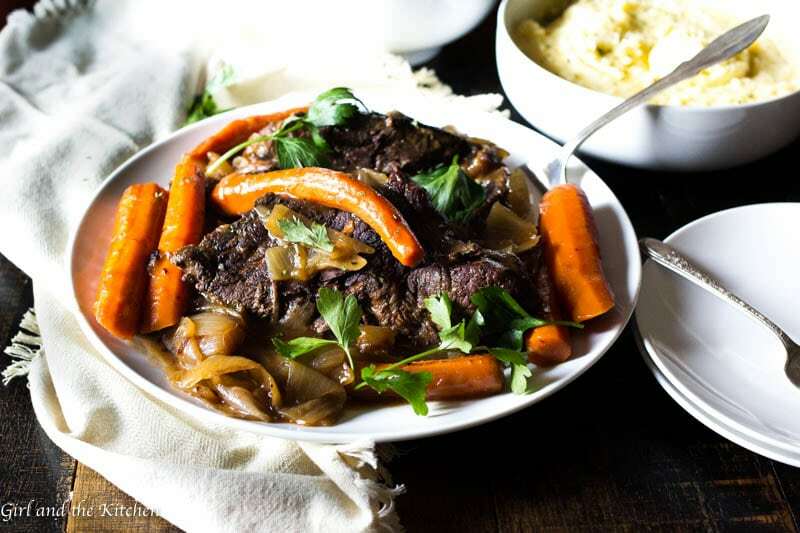 Learn how to make the ultimate pot roast all in one pot with maximum flavor and minimum effort. This is going to be your ultimate comfort dinner. Sometimes the most amazing meals come out of necessity and that feeling in your gut that aches for comfort food when the colorful leaves starting making their way from the trees and onto the dewy ground. It reminds me of Sundays. When I used to grow up in the motherland…aka Moldova..aka the former USSR. As much as I loved summer…I have extremely fond memories of blistering cold winters and a warm food filled home. On Sundays, my dad would lounge around on the couch, reading one of his many books, my brother would go upstairs in our condo to one of his many friends’ homes and my mom and babushka would huddle in our oversized kitchen around the stove cooking up all sorts of soul warming goodies. I would sit at the kitchen table across the way watching them, pretending to read one of my books, in the meanwhile just aching to get in on the cooking action. I’ve mentioned many a time before, that my my mom was an incredible cook. My love for cooking comes from her. She always taught me that if there is no love in your food, there is no flavor there either. My mom had this incredible skill at making the BEST pot roasts. She could turn any meat into succulent bites of heaven. It was from my mom that I learned to cook on a low flame. In my adolescent mind I thought that if you can cook faster and hotter you should. But once, when I was watching my mom make her famous pot roast, she explained to me that when using a piece of meat like this it must always cook low and slow. Only then does it become tender and moist and the fat breaks down. I searched far and wide for a pot roast that was different than my mothers. There are thousands of recipes but there were two Martha Stewart recipes that seemed to stand out to me more than the others. 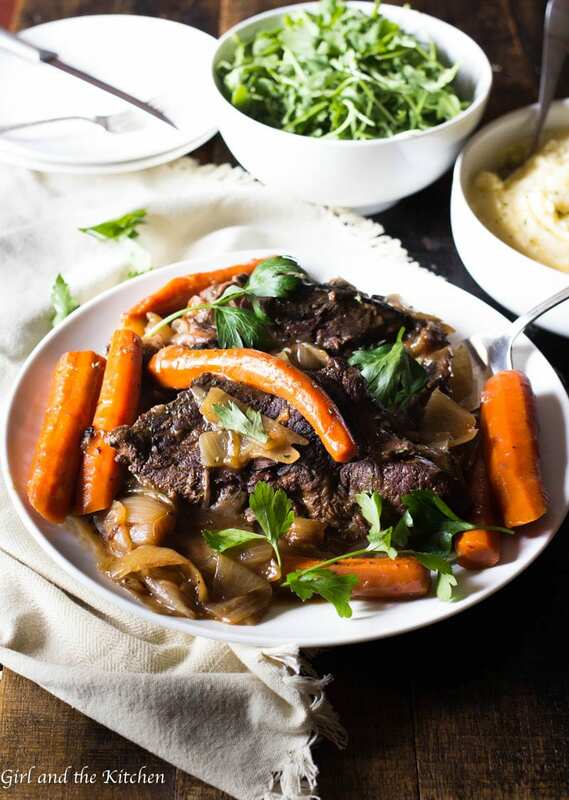 Naturally Martha is #killingit with her recipes so I figured combining my favorite flavors and a few of her techniques would result in the perfect fall apart roast that I had dreamt of. Make sure you buy a good quality meat. I get mine from a local farm called Crestwood Farms. Their cows are grass fed and free range. I very rarely get any meat at the grocery store anymore. It is much more cost effective for me to get my meat from the local farm and I know it is a better quality, better flavor and the cows are treated better. Wins all around! Your meat should have a nice amount of marbling on it. 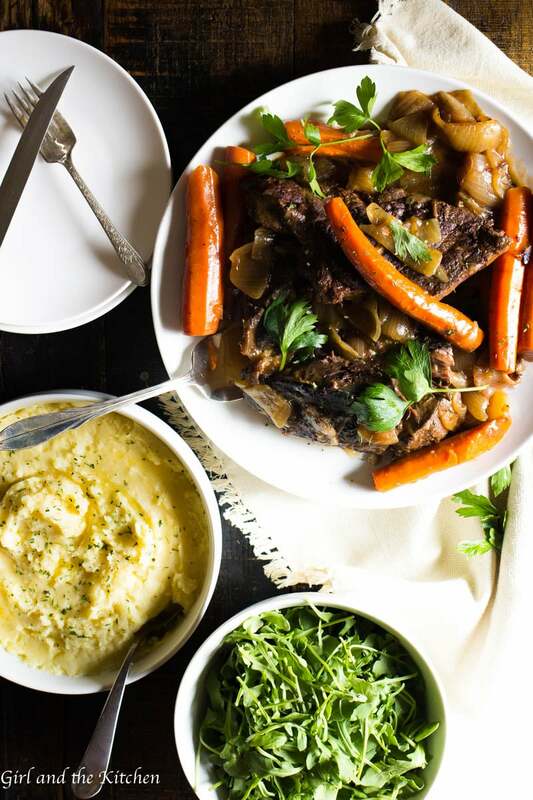 You want to buy a nice chuck roast or one that says its a “pot roast” cut (duh). Steer clear from flank steaks or sirloins, those are very lean. You want that fat there because it will break down and leave your meat nice and tender. Most of that fat will render off and you can then skim it once it is done cooking. COOK. IT. SLOW. This is always the key with tough meats. Similarly to my Melt in Your Mouth Brisket, slow cooking will give you the tender results you want. The meat will be uber tender and just at the fork tender point. IF you cook it a high temperature it will toughen up and sadly no amount of slow cooking will tenderize it again. Take your time. 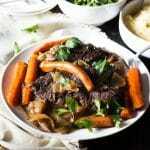 The slow cooking aspect of this pot roast makes it ideal for Sunday dinners. It fills your house with all sorts of delicious aromas and makes your soul feel a bit lighter in the colder months of the year. It slowly permeates the meat with loads and loads of flavor without needing to poke the meat and sticking cloves in. Which is a TIME SAVER. As the garlic cooks down it also sweetens and becomes mild and loses the “bite” that garlic frequently has. It flavors the sauce with sweet and savory notes of roasted garlic without having to roast the garlic before. CHEF TIP: If you love garlic as much as I do. Buy the unpeeled garlic, toss it into a Vitamix or a food processor with some olive oil. Once it is pureed you will have delicious minced garlic for the week to use in your recipes. This will last several weeks in the fridge as well. I made this dinner for the munchkin and hubs on such a Sunday when the weather was just starting to turn and comfort food was calling my hubs name. I served it with a very simple tossed baby arugula salad with just some lemon juice, salt and pepper. And naturally my creamy dreamy mashed potatoes to soak up all those luscious sauces from the pot roast. The end result left everyone smiling and ready to lounge on the couch just in time for a Sunday movie night. These nights are what makes my heart smile and my soul at peace. In a large dutch oven pot, pour in the 2 tablespoons of oil and bring up to high heat. Season the meat with the course salt and ground pepper. Be liberal with it. Once the oil is smoking in the pan, place the beef into the pan and sear it on all sides. This will take about 10 minutes. Remove the meat and place on large plate or cutting board. Slather the meat with the minced garlic and reserve. Add stock, tomato paste, red wine, worcestershire sauce, cornstarch and water mixture, thyme sprigs. With a rubber spatula or a wooden spoon, scrub the bottom of the pan to remove all browned bits. This is your flavor!!! Do not lose it. Bring the mixture up to a simmer. Add in your meat fat side up. Make sure the liquid comes up half way up the meat. If you need more liquid just add in a bit more broth or stock. Cover with a tight fitting lid or with foil. Cook for 3 hours. Remove from the oven add in the vegetables and cook for another hour. Once it is pulling apart with a fork nicely, it is done. You can then remove the vegetables and the meat and skim the fat. 1. You can make this a one pot complete dinner by adding in some potatoes cut into large wedges in the last hour of cooking. 2. Combining the cornstarch with the water is called a slurry. It will thicken up your sauce nicely and will not clump up. 3.The nutritional information is to be used for information purposes only. 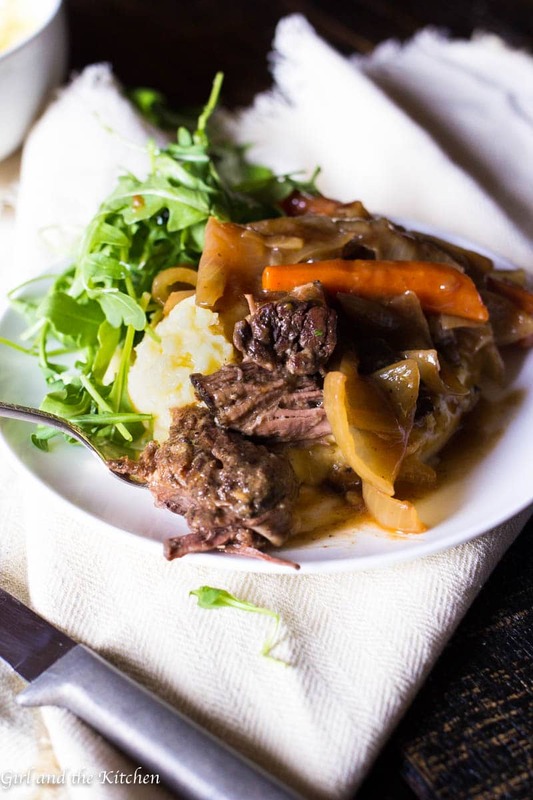 It’s got to be a ‘Mom thing’…my mom’s pot roasts were one of my favorite things that she made, as well! I am with you on the marbling, the slow-cooked, and all the gorgeous garlic!! I can imagine the aroma in your home as this was perfuming the air! Beautiful job, my friend! Just beautiful! Thanks for your kind words as always Annie. Ohhhh yay Josh!!! Thank you so much for coming back and telling me this!!! I’m so glad it worked out!!! Crazy how simple delicious food can be right? !